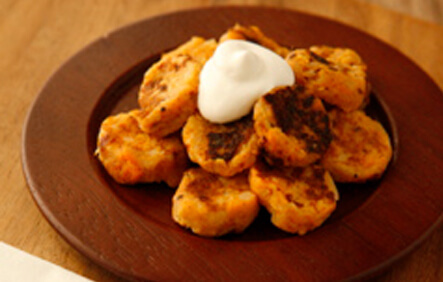 Every toddler and grown-up who has ever tasted these sweet potato cakes absolutely loves them. Made from the delicious sweet potato, the cakes melt in the mouth. These are even great cold the next day or as a midnight snack for a breastfeeding mama! Peel and dice the potatoes and place them in a pot of cold water. Bring to a boil. Reduce the heat and simmer for 30 minutes, or until thoroughly cooked. Drain the potatoes and let them cool. Peel and dice the yam into 1-inch pieces. Steam the yams for 20 minutes, or until soft. Place the yams and potatoes in a large bowl. Mash until well mixed and only a little lumpiness remains. Set aside. Heat the oil in a medium skillet over low heat. Add the onion, salt, pepper, and wheat germ. Cook until the onion is soft and begins to brown. Add the garlic and cook 1 minute more. Remove from the heat. Add to the potato mixture. Beat the eggs and cream together in a mixing bowl. Stir them into the potato mixture along with the cheeses and flour. Heat a nonstick skillet over medium-high heat or set a nonstick electric skillet to 375ËšF. Flatten 1 heaping tablespoon of batter into a round cake and place in the skillet. Repeat with the remaining batter. Cook the cakes for 5 minutes per side, or until a brown crust forms on each side. Serve warm with a dollop of sour cream as a dipping sauce.